Spooked by hostile markets, Rome’s anti-austerity government is offering to cut its 2019 budget deficit goal. The U-turn could help avoid EU fines. But if the new targets are achieved by simply delaying promised freebies, tensions with the EU and investors may return next year. 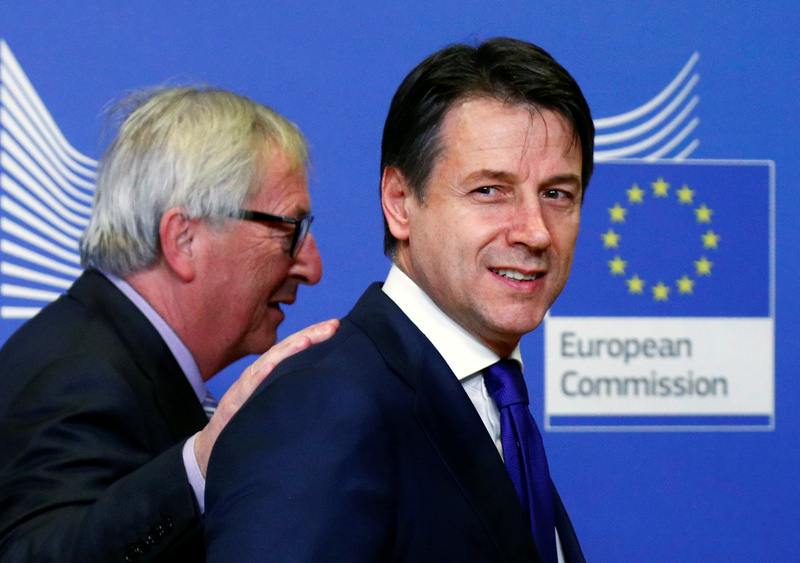 Italian Prime Minister Giuseppe Conte poses with European Commission President Jean-Claude Juncker ahead of a meeting at the EU Commission headquarters in Brussels, Belgium December 12, 2018. The Italian government offered to lower its deficit target for 2019 to 2.04 percent of GDP from a previous goal of 2.4 percent. The latter target violated European fiscal rules, which require Italy to cut its deficit, after adjusting for economic swings, and to gradually lower its debt. Italy’s 10-year government bond yields dropped to 2.95 percent on Dec. 13, the lowest level in two-and-a-half months. The difference between Italy’s and Germany’s 10-year yields was 270 basis points, the tightest level since October.